For more information about staying safe during the holiday, visit www.usa.gov/Topics/Independence-Day.shtml . 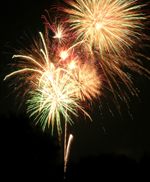 For a full list of Oklahoma laws regarding fireworks, visit www.oscn.net . From there, click “Legal Document Index” at the top of the page and search for “fireworks” under the Oklahoma option.